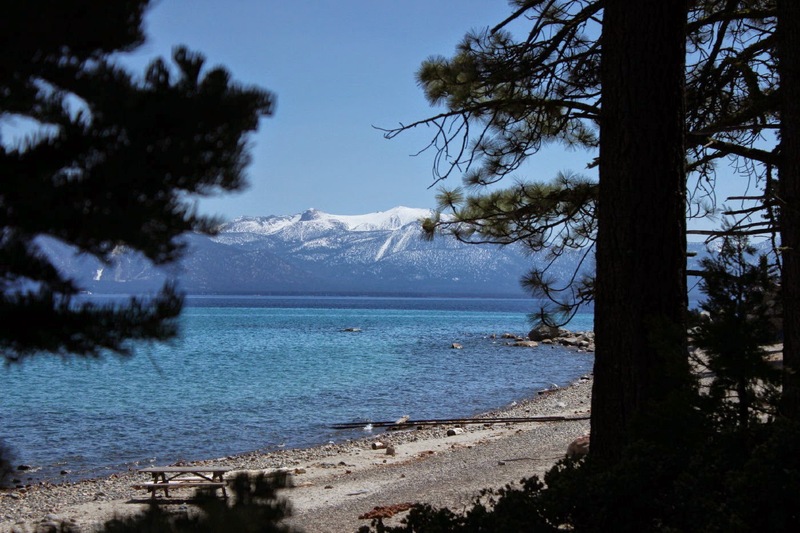 From Topaz Lake on Route 395, the daring duo heads north to Carson City. Nevada. That's named after the folk hero, explorer, and military leader who was a scout for the explorer John Fremont. A very small city and yet it is the capitol of Nevada. As we drove through town, we had to stop at the main crosswalk to let the legislators cross for lunch. 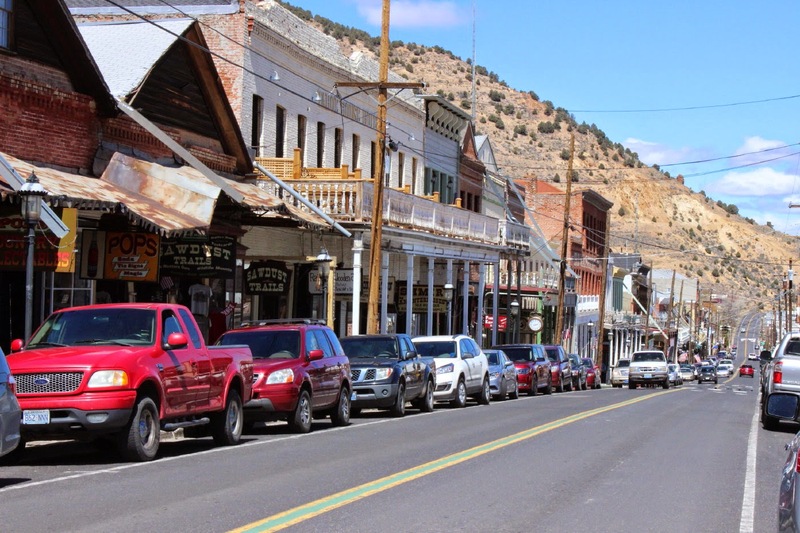 After a day of snow flurries and some rain, we head to Virginia City, Nevada. 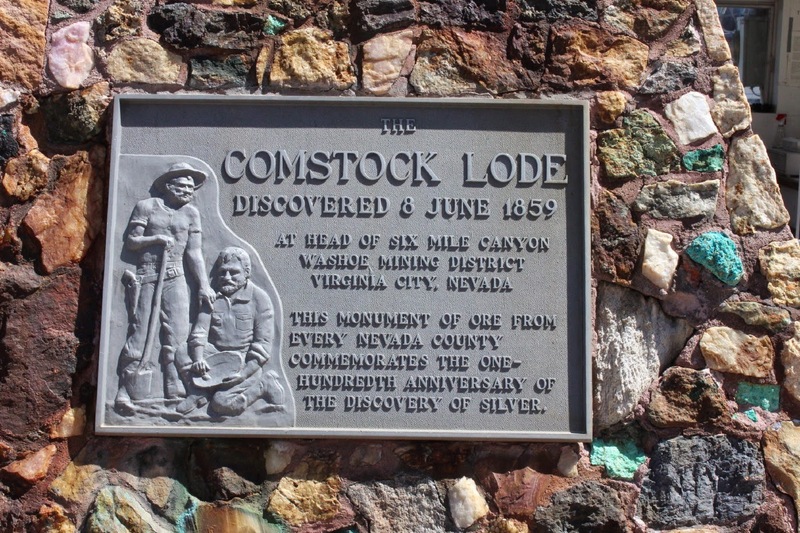 Known world wide for the Comstock Lode discovery of silver in 1859. To the right is part of the main street, Highway 341. 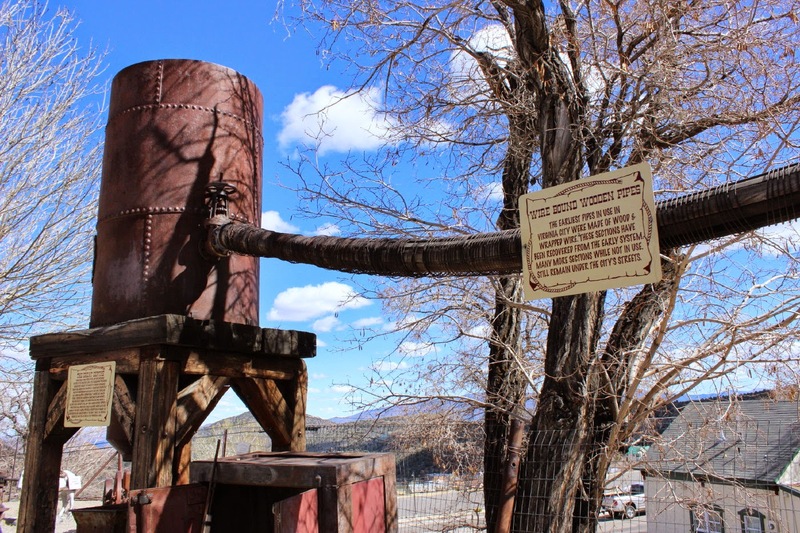 At the height of the silver mining era, Virginia City was the richest city in the world. Over 30,000 people with an opera house, a red light district, restaurants, and , of course, the miners. This Mackay Mansion was where the rich came to stay. Population now is about 900. 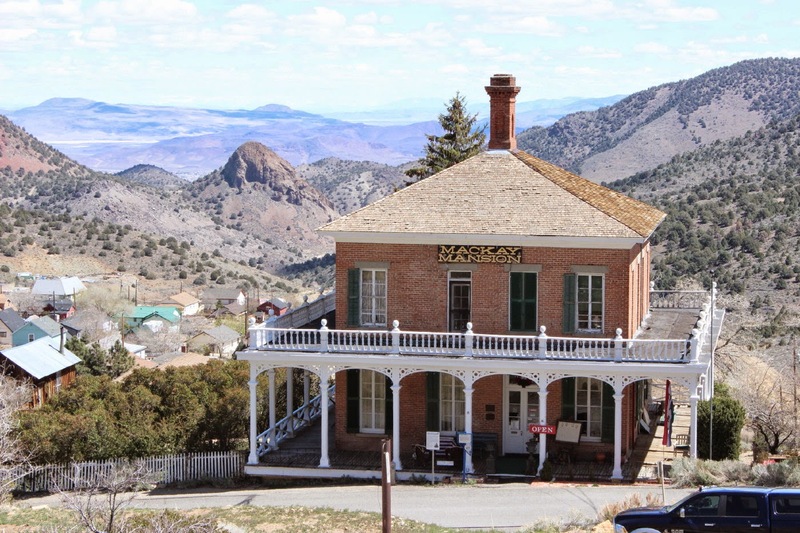 At about 2,000 feet higher elevation(6200 feet) and about 15 miles from Carson City, you can see some beautiful views right from the main street. Now the largest historical monument in the US, it is a much smaller tourist city. Everywhere you see the sign of the mining that was the mark of this city. A number of restaurants, jewelry stores, and hotels, all in the look of the 1800's. There was no mint here in the 1800's. 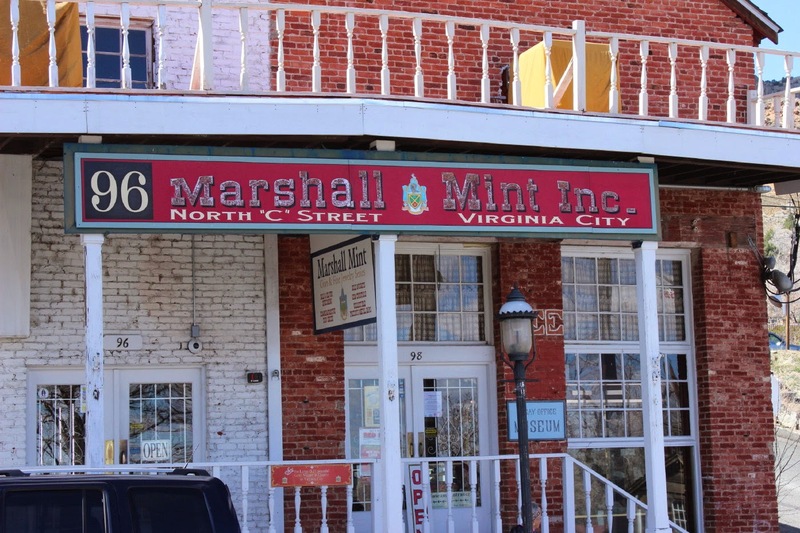 The gold and silver went to the Carson City mint. The money from the successful miners mostly found its way to San Francisco and other cities. This mint actually does mint commemorative coins and medals. It also has a good collection of gems and minerals from around the world including a 5 pound gold nugget. Also some of the earliest Carson City silver dollars. These are the Morgan dollars that begin at 1878. And , of course, a mining museum in the center of town. The Comstock Lode started with a good vein of silver and some gold that kept going deeper. That resulted in some 400 miles of underground tunnels requiring lots of wood. You can still visit some mines on tours and there is a lot of mining equipment all around. This picture is of a wooden water pipe wrapped with wire. All kinds of information! 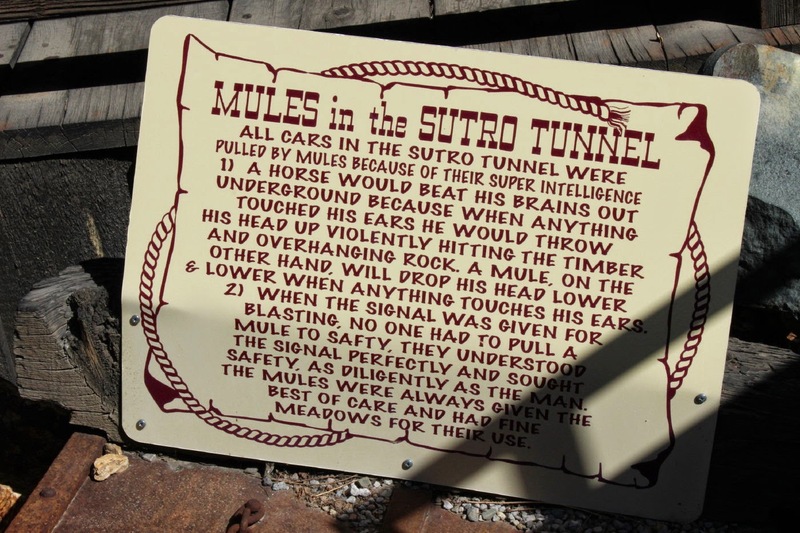 Why were mules better than horses in the tunnels? Click on the picture to enlarge and answer. Also, examples of the train cars and water pumps to pull the ore up from way below the surface. The monument right on the main street. Some of the pieces in the museum are quite interesting. 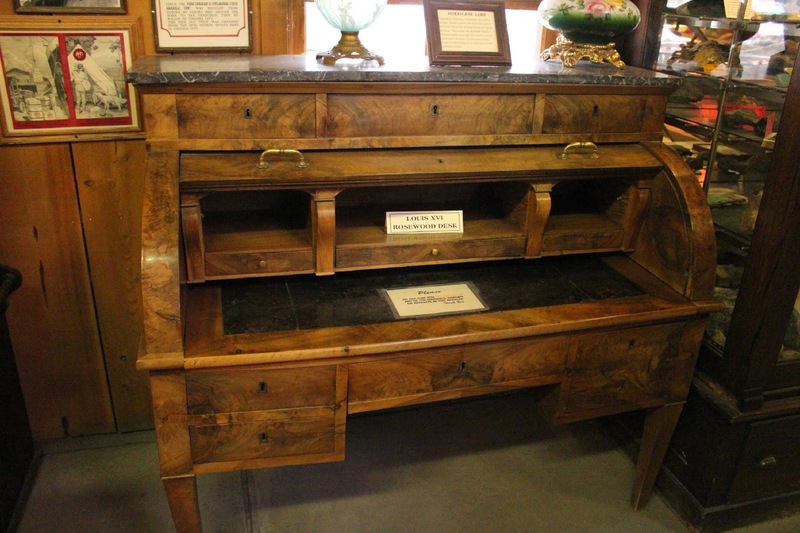 We thought Gary and Dave might enjoy the Louis XVI Rosewood desk. How many know this or had one close by? 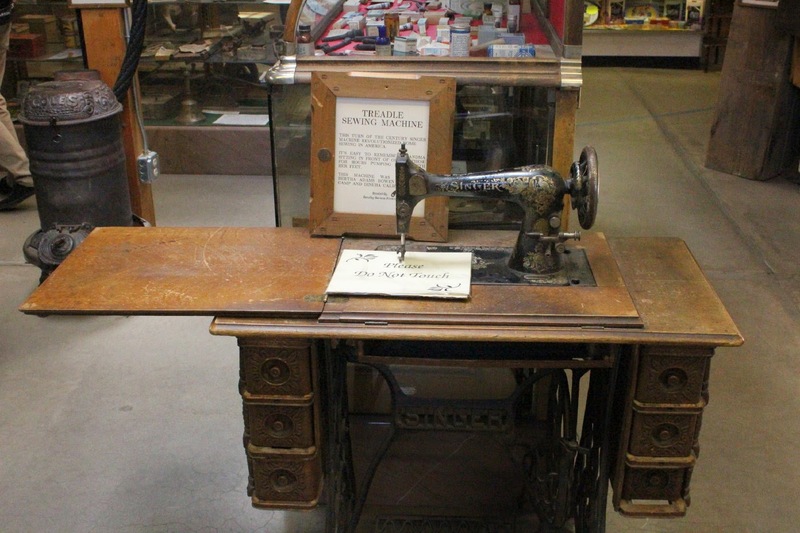 We remember Great Grandmother Marshall and Grammy Pope having one permanently set up in their rooms. I think theirs were also a treadles, that is , non-electric and you supplied the energy with your feet or foot. 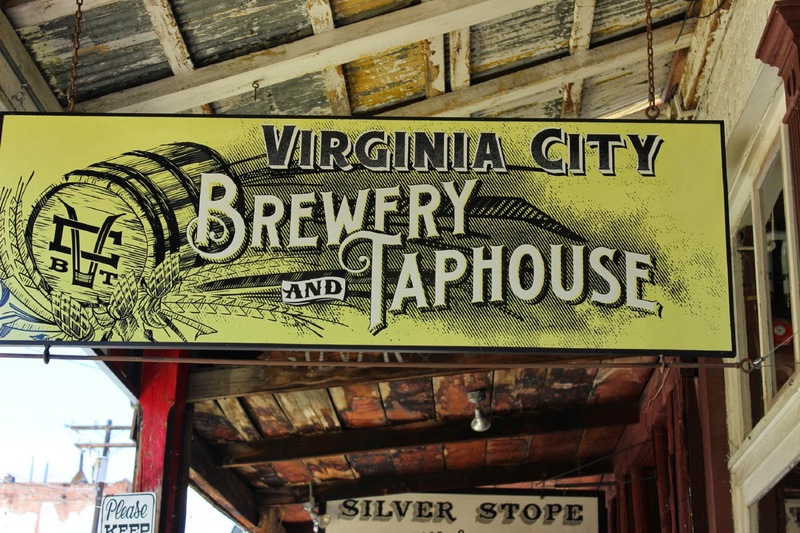 There are other places to note in Virginia City. A number of interesting restaurants. 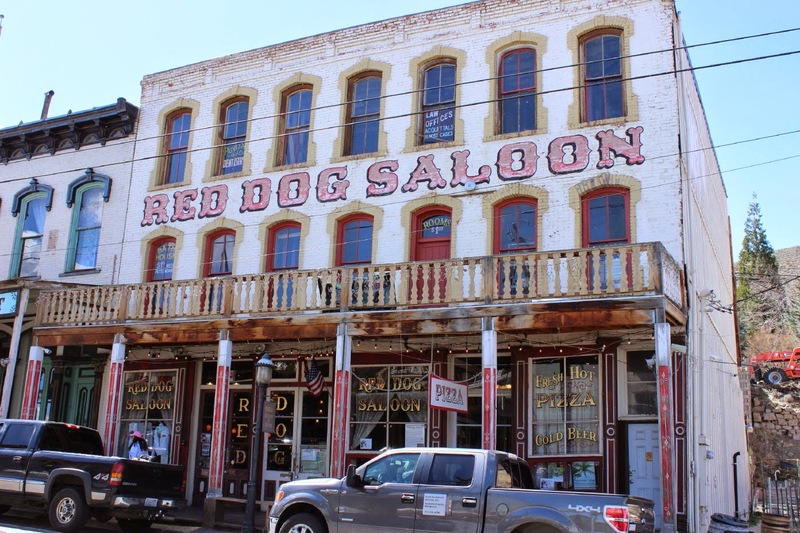 We were interested in the Red Dog Saloon. In 1965 , the Red Dog started and looked for a band in San Francisco to be a house band. What they found was a band called the Charlatans. They were the beginning of a style called Pschedelic. All kinds of antiques lying around. This is a Ford truck. 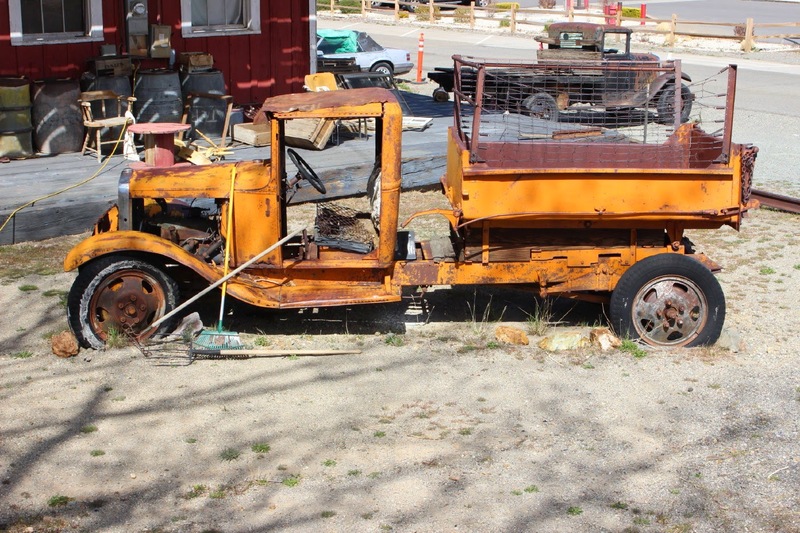 Some people would love to take this home and restore it. This one we liked because it still had the wooden spoke wheels. 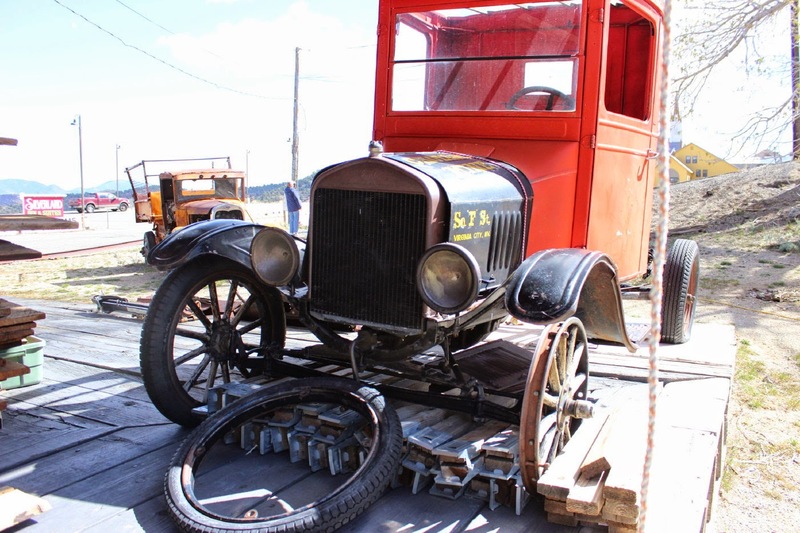 Also a Ford, I think it was working around the 1913 era. This is the view we had out Lady Blue's back window at Virginia City Rv Park. 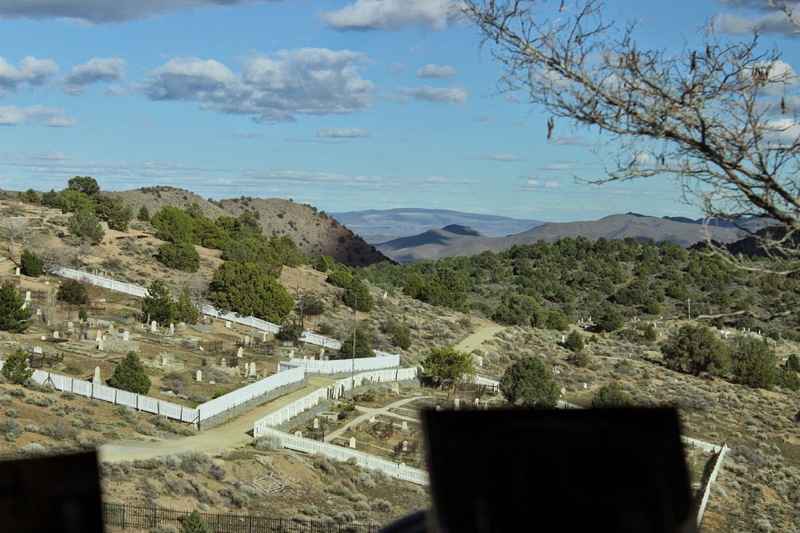 Those are the Virginia City cemeteries below. Our hosts were very gracious and happy to help. They also had the local market in the campground. 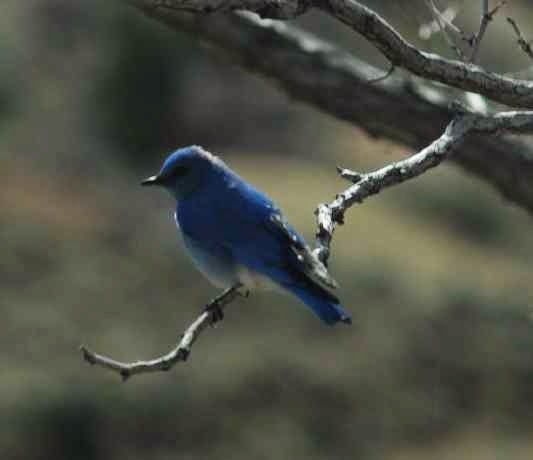 We enjoyed also watching the bluebirds being very active in the campground. Something about those bright blues. From Virginia City, it was a reasonable drive over the mountains to Lake Tahoe. We will be posting more from this beautiful spot soon.